It is essential to create international networks while working in the field of science. The goal of this symposium was to bring together experienced and young researchers from various countries working in the field of optics, and to provide a perfect setting for their discussions of the most recent developments in that area. In total 14 invited speakers from 10 different European Research Institutions presented their work on different research topics. Participants spent 4 days full of very impressive talks, discussions, friendly coffee breaks, Italian food in a middle of the beautiful Trentino mountains. 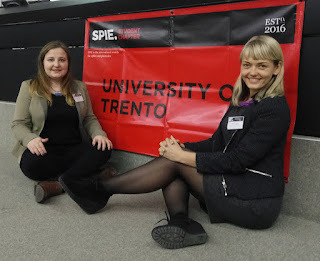 We would like to thank our supporters: SPIE and University of Latvia.The scientific work presented at the conference by PhD student Marta Lange was supported by the European Regional Development Fund project “Portable Device for Non-contact Early Diagnostics of Skin Cancer” (No. 1.1.1.1/16/A/197).